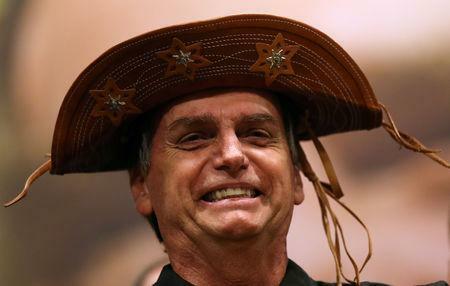 RIO DE JANEIRO (Reuters) - Brazil's leading presidential candidate vowed to defend freedom of the press after his tirades against the media and reports of his supporters attacking journalists raised fears that civil liberties might suffer if he is elected. Soon after describing the media as "trash" in a Thursday tweet, far-right congressman and former army captain Jair Bolsonaro turned around and called journalists "friends," pledging to defend their work. "When they cover the facts, without political activism and partiality, the media fulfil the valuable role of informing people," he said on Twitter, adding "WE ARE AGAINST ANY TYPE OF SOCIAL CONTROL OF THE MEDIA AND INTERNET." Like U.S. President Donald Trump, whose 2016 campaign he has emulated, Bolsonaro has derided critical press coverage as "fake news" and connected directly with supporters on social media, where he posts video chats, retweets right-wing outlets and suggests the media is part of a corrupt system out to stop him. In a Friday interview, his presidential rival, leftist Fernando Haddad, criticized Bolsonaro's campaign for "fostering a culture of violence." In Brazil's most bitterly polarized election since the end of military rule in 1985, Bolsonaro's stabbing by a mentally disturbed man has been the most prominent in a string of violent acts hanging over the race. 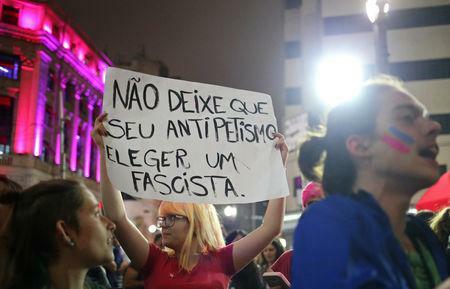 Since the impeachment of former President Dilma Rousseff, which Haddad's Workers Party (PT) called a media-supported "coup," crowds at leftist rallies have also been accused of intimidating camera crews from major TV stations. "There is no doubt we've had violent episodes and a growing climate of fear," said Diego Escosteguy, former editor-in-chief of newsweekly Epoca and critic of the PT. "Journalists, blacks, women, transsexuals, gays, PT voters - many are afraid," he tweeted on Friday. "That fear is not paranoia. It is the result of what Bolsonaro and his allies say - and what the candidate does not say." "Members of the press, or maybe I should say 'friends,' ... we're going to guarantee the freedom of the press," he said. "We want for you to really be independent, and be responsible in everything that you write," he added. "If by any chance it was somebody who voted for me, I reject that sort of vote. They committed a crime, they'll have to pay," he said. "My people are not disseminating hate."